This pizza dough comes together in minutes and doesn’t need a mixer to achieve success. You can easily double this recipe if you would like to make two sheet pan pizzas. Combine yeast, water and sugar in a medium mixing bowl. Allow yeast to proof for five minutes. Add 1 cup flour. Mix with wooden spoon or dough whisk. Add olive oil, salt and remaining flour. Mix until dough pulls from the sides of the bowl. Dust flour onto your hands and knead dough (in bowl or on lightly floured counter top) for two minutes until smooth. Cover bowl with plastic wrap and allow dough to sit in warm spot until doubled in size, about an hour. Lightly flour a sheet pan (10x14-inch) and your hands. Punch down dough and place on prepared sheet pan. Stretch out dough until it completely covers pan, leaving a bit of a crust around the edges. Ladle sauce on dough, spreading evenly over top of dough. Sprinkle with shredded cheese and toppings of choice. Bake for twenty minutes until crust and cheese are golden brown. In partnership with Joy of Kosher. Amazing crust! 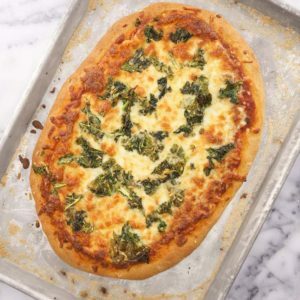 Bake it for dinner, with kale and Romano cheese . Thanks for sharing the recipe with all of us !